Posted in financial aid, need-based aid, student loans | Comments Off on New report on Parent PLUS loans. Parents need to dig deep to know the true “net price” of college for their children. Six in ten families rule out some colleges because of sticker price, yet many do not know that the “net price” is typically far lower. Stanford’s sticker price for tuition, living expenses, and books is $55,918, while Cal State Long Beach’s is $20,675. But for some low-income students, aid discounts those prices to $4,496 and $3,593 respectively. To help parents and students make informed choices, the federal government now requires “net price calculators” on college websites. That is a start, but proactively teaching parents—especially those with lower incomes—to think in terms of net price is critical. An AEI survey found that a majority of parents do recognize a distinction between sticker price and net price after aid when asked to think of the cost for a low-income student. 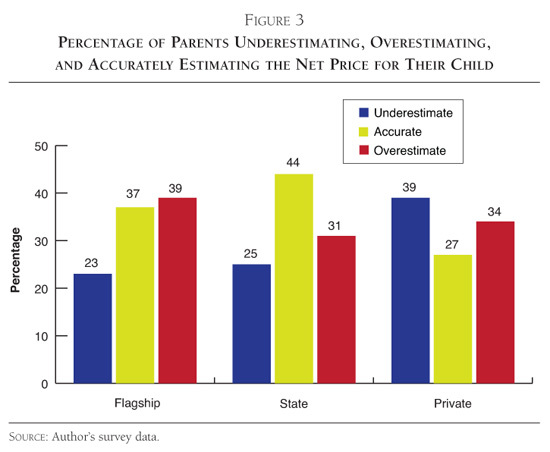 Low-income parents tend to overestimate the net price for their child. Three corrective measures: (1) generate net prices for the schools students list on financial aid forms; (2) enlist guidance counselors to marshal relevant data; and (3) encourage web developers to create online tools that help to compare net prices across institutions. It would be better if families could easily know upfront what the college costs would be. For many families, though, the net price of college remains hidden until far too late in the process. Colleges engage in what economists call “price discrimination”: they set a sticker price and then tailor aid packages to reduce the actual cost of attendance based on student characteristics like family background, academic qualifications, and other accomplishments. Price discrimination is an important recruiting tool for colleges and universities, who use aid packages to attract the desired mix of students.